Going to the Acores? 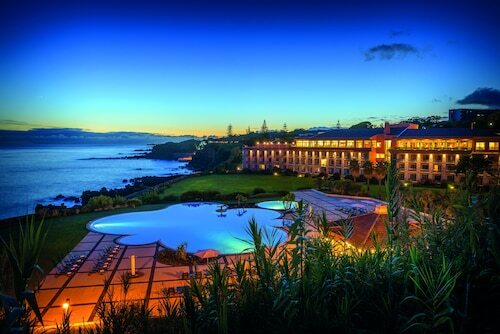 Find an Azores hotel here. I have added reviews and listings for Azores hotels in Sao Miguel, Pico, Santa Maria, Terceira, Sao Jorge and Faial. To read the reviews, simply click on the images provided and you will be able to see reviews of the hotels as well as availability to book. Location: Located in the beautiful Terra Nostra Park in Furnas. Location: Right on the waterfront in Ponta Delgada. Marina, shops, restaurants and boardwalk. Notable Amenities: self catering cottages with fully equipped kitchens. Set in a wonderfully landscaped property with sculptures and gardens that are second to none. These cottages are my personal favourite for Sao Miguel. This hotel is rated quite well. It is in the heart of Angra do Heroismo and features a pool, free buffet breakfast, a bar area and nice views. Located in Angra do Heroismo and features an indoor pool. Also features free buffet breakfast and free WiFi in public areas are also provided. Additionally, a bar/lounge, a sauna, and a rooftop terrace are onsite. All 120 soundproofed rooms feature free WiFi and minibars. Guests will also find cable TV, room service, and premium bedding. This hostel is in Sao Roque and features free breakfast. There is a lounge / bar area to relax in.